Dogs that are already experienced swimmers will be allowed to self-swim after an initial swim assessment appointment to demonstrate they do not need assistance. The owner can bring their dog's favorite toys to throw for retrieving, or we will have toys available. The owner can get in the pool with their dog, but it is not required. Self swims are great for healthy dogs who love swimming and are just needing some play time and exercise and also wonderful to keep performance dogs in top physical condition. Prices are for one dog. Each additional dog per owner for self swim is $12.00. There will be times scheduled where the pool will be used strictly for recreational swims for experienced swimmers, and those dogs who have completed the initial swim assessment. A ramp leading up to and into the pool provides easy access. The deck surrounding the pool allows owners to view and play with their dogs. There will be multiple dogs using the pool at the same time and no owners will be allowed in the pool. No appointment is necessary for recreational swims. Prices are for one dog. Each additional dog per owner for recreational swim is $12.00. Is the initial assessment needed if my dog swims in lakes and rivers? ​Yes, swimming in pools is different than lakes and rivers. The access ramp can be a challenge for some dogs. How many dogs can be in the pool at one time? ​The exact number is based mostly on the size of dogs swimming. PAWS reserves the right to determine the number of dogs safe for the session. Can my dog jump off the dock during rec swim? ​No, for safety reasons dogs may not dock dive during rec swim. How long can my dog swim during rec swim? ​It depends on the dog's swimming experience, age, and stamina. For new swimmers, we recommend no more than 30 minutes. Should I bring my own towels for rec and self swim? ​Yes! Please bring your own towels for rec and self swim. What if something happens to my dog during rec swim and I'm not in the pool? ​There is a canine CPR trained volunteer in the pool at all times during rec swim. Can my dog wear a life jacket during rec swim? 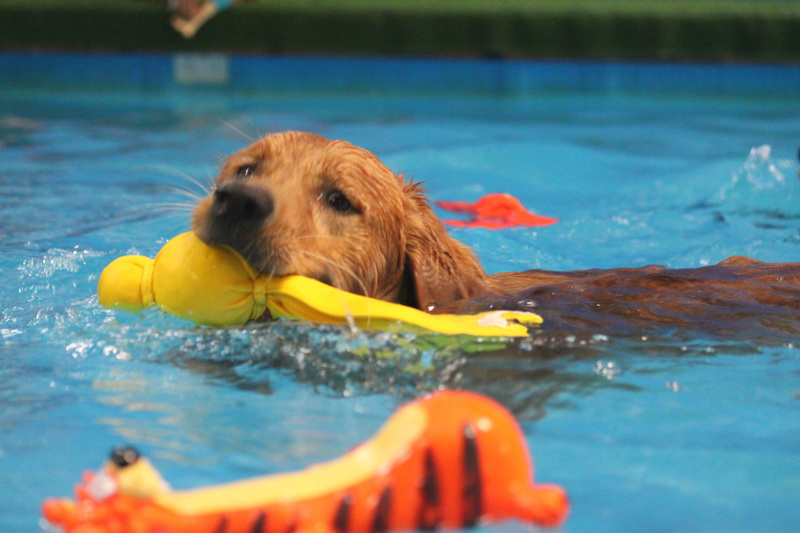 All dogs whether swimming for recovery or for fun will be required to have a complete our modified swim assessment, determined by the therapist, on their first visit. We will fit them with a float vest or a harness depending on their swimming ability. Most dogs will only require the vest for a short period of time before feeling comfortable in the water. Dogs that have done the initial swim assessment at either Paws Aquatics or Doggie Paddle do not have to repeat the assessment appointment. If your dog is over 10 years old or currently being treated for a medical or surgical condition, they are required to have a veterinary consent form.